1867, 3¢ rose, A. grill, clearly-defined grill, s.e. 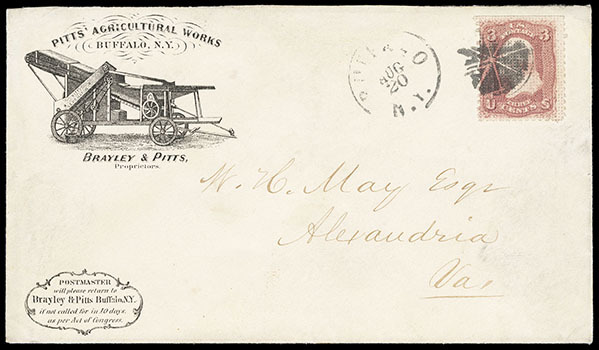 at top, far better perfs than normally seen on this issue, tied by circle of wedges duplexed with "Buffalo N.Y. Aug 20" cds on Pitts' Agricultural Works illustrated corner card cover depicting a separating machine to Alexandria Va., Very Fine and choice, it is rare to find a 3¢ A. grill in such nice condition on a beautiful cover; with 2007 P.F. certificate. 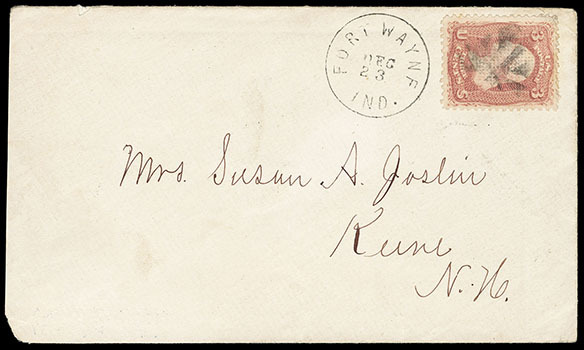 1867, 3¢ Rose, C. Grill, strong clear grill impression and full margins, canceled by neat geometric with matching "Fort Wayne, Ind., Dec 23" cds alongside, on cover to Keene N.H.; cover reduced at left, Very Fine, a scarce on cover usage. Scott No. 83; $1,300 Estimate $300 - 400. 1867, 2¢ black, F. grill, horizontal pair, tied by two strikes of blue "Cincinnati, O., Jan 13" cds and target duplex on green allover illustrated J.A. 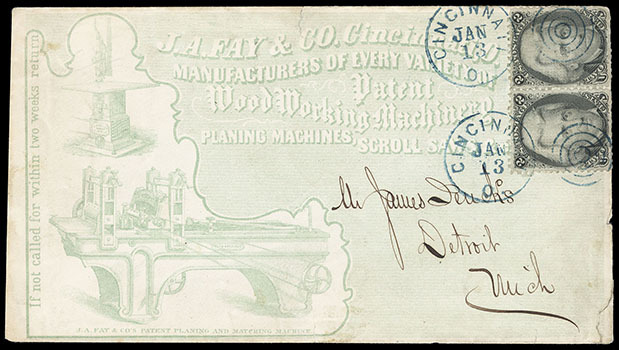 Fay & Co. manufacturer ad cover showing Planning and Matching Machines, to Detroit, Mich.; small cover tears and stamp perf flaws from cover overlap, F.-V.F. and attractive. Scott No. 93 Estimate $300 - 400. 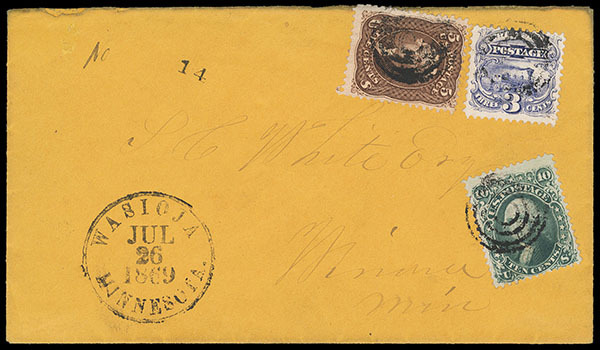 1867, 10¢ yellow green, F. grill, used with 5¢ brown, F. grill (95) and 3¢ ultramarine (114), each tied by four-ring cancel, matching "Wasioja, Minnesota, Jul 26, 1869" cds on orange registered cover to Winona Min., manuscript "No" and handstamped "14" registry number at top left; small top left edge mend, Very Fine. Scott No. 96 Estimate $1,000 - 1,500. 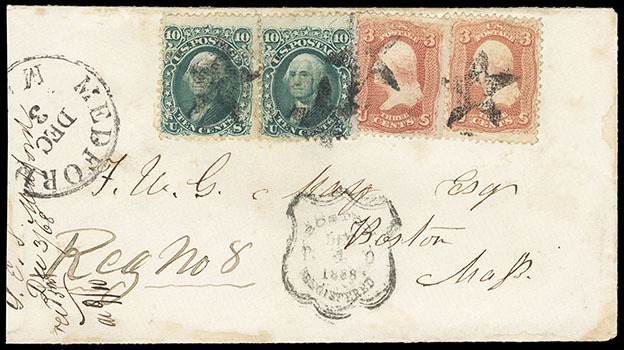 AN UNUSUAL ALL-GRILLED 1868 & 1869 MIXED ISSUE FRANKING PREPAYING THE 3¢ LETTER RATE PLUS 15¢ REGISTRY FEE. 1867, 10¢ yellow green, F. grill, cancelled by grid cancel and tied by red "Paid" straightline, additional strike at left on cover to Paris, France, red "New York, Feb 12" exchange cds, "Short Paid" straightline on reverse, red London (2.23.70) transit backstamp and sharp "GB/40c" oval accounting handstamp, forwarded locally with France 10c bister (32) tied by Paris (2.24) cds and "3" dotted star cancel; small piece out at bottom right, F.-V.F. combination use; with 2002 P.F. certificate. Scott No. 96 Estimate $750 - 1,000. 1867, 10¢ yellow green, F. grill, pair used with two 3¢ rose, F. grill (94) singles, cancelled and tied by Star fancy cancels, matching "Medford Mass. Dec 3" cds on registered cover to Boston Mass., "Boston Registered, Dec 4 1868" shield postmark as receiver, 1868 docketing at left; reduced at left, F.-V.F. and scarce Boston Registered Shield receiver, ex-Beane. Scott No. 96 Estimate $400 - 600. 1867, 12¢ black, F. grill, horizontal pair, well centered, couple short perfs, tied by fancy radial cancels and magenta "San Francisco Cal. 'Paid' Apr 9" exchange cds, endorsed "p. Steamer via Panama" at top, left, San Francisco "Too Late" oval handstamp, carried by NGL Line Main from New York Apr. 22nd to Southampton arriving May 5th, red London (5.6.69) arrival cds; edge wear, F.-V.F., ex-Gliedman. Scott No. 97 $525 as used pair. The San Francisco "Too Late" oval was applied indicating cover arrived late for a recently departed steamer. Likely routed overland (12-15 day transit) as a result to make the NGL Line "Main" departing New York Apr. 22nd. 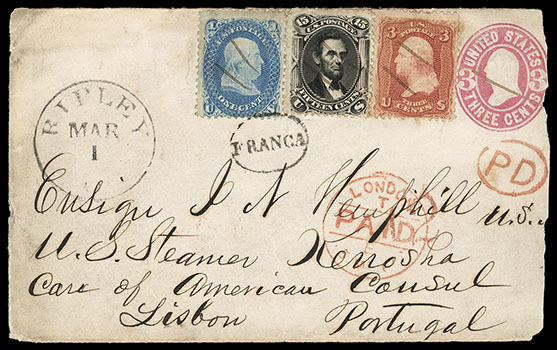 1867, 15¢ black, F. grill, used with 1¢ blue, 3¢ rose, F. grills (93, 94), all cancelled by manuscript on 3¢ pink (U58) entire to Lisbon, Portugal, addressed to an ensign on U.S.S. Kenosha in care of American consul, "Ripley O. Mar 1" cds, red "New York Paid All Br. Transit, Mar 4" exchange cds and matching "12" credit handstamp to G.B., red London Paid (3.15) transit and matching oval "PD" handstamp, Lisbon (3.20) backstamp and oval "Franca" handstamp tying 1¢ and 15¢; small faults including irregular reduction at right, Fine and rare destination, ex-Landau. Scott No. 98 Estimate $500 - 750. 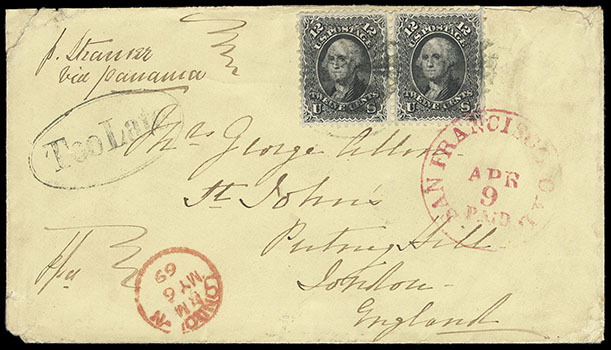 ONE OF TWO RECORDED 1866-67 15¢ COVERS TO PORTUGAL.